Thank you St. Jude for answering my prayers again. You always come through for me and my family. 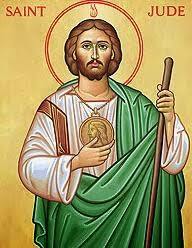 Most holy Apostle, St. Jude, faithful servant and friend of Jesus, the Church honors and invokes you universally as the patron of hope. Please intercede on Nicholas behalf. Make use of that particular privilege given to you to bring hope, comfort, and help where they are needed most. Please come to Nicholas’s assistance in this great need that he may receive the consolation and help of heaven as he work with his challenges, particularly his feelings hopelessness, sadness, overwhelmingness, and feeling he has failed. Help him to feel happy, and accept his healing and receive and accept help joyfully. I praise God with you and all the saints forever. I promise, blessed St. Jude, to be ever mindful of this great favor, to always honor you as my special and powerful patron and to gratefully encourage devotion to you. Amen and thank you very much. St. Jude. Thank you for helping me. Please intercede on my behalf and reconcile me w john. There are so many obstacles in the way but i know you have the power to request intercession. Please soften his hard beliefs and fill his heart w my love. Help him envision a happy future w me. I truly love him and hope its Gods will that we get back together. I am forever in your mercy.